Kicktone is an Adelaide startup that has developed an online store designed to increase the visibility of independent musicians. Independent music is an “underserviced market,” according to Kicktone co-founder, Savvas Dimitriou. “Independent artists don’t have million-dollar marketing budgets,” making it hard for them to get discovered on Apple’s iTunes store or Spotify, he said. A major disadvantage to selling music on a store like iTunes is that listeners only get to hear a sample of each song, sometimes as short as 30 seconds, he said. That hurts independents more than the mainstream where customers are more likely to have heard the song before, he said. While Spotify has enabled indie artists to stream entire albums to the public for free, it is still difficult for customers to discover independent music unless they are directly searching for it, he said. Also, Spotify offers small rewards for the artist, he said. On the Kicktone website, indie musicians upload their music in a lossless format and receive a landing page which they can share to fans. Customers can stream albums for free or pay to download one of six audio formats. The album streams can also be embedded on other websites. The band sets pricing—which can be as low as free—and what currency they want to transact in. Customers can optionally add a donation if they want to give the artist more money. Looking at all transactions across the site, “on average, fans have paid 27 per cent more than the required amount,” he said. Among just the transactions where fans paid more, customers paid 127 per cent more than the price, he said. When a purchase is made, the money from the sale is transferred immediately to the musician’s PayPal account. Kicktone tells users it will take a 15 per cent of sales, but the startup isn’t yet taking any money while it continues to build the website, Dimitriou said. In comparison, iTunes takes a 30 per cent cut, “and then they spend that money on promoting Justin Bieber or Lady Gaga,” he said. Kicktone has developed its own music discovery engine that matches listeners to artists based on interests (using Facebook) and acoustics matching. The latter looks for music that has a similar sound to music that the user has listened to and liked. 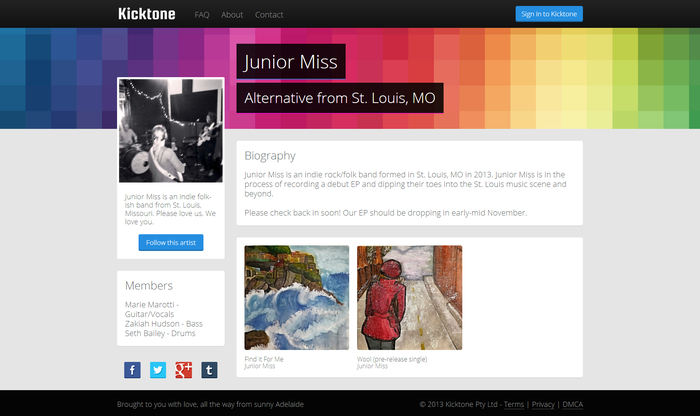 Kicktone targets both musicians who are unsigned and those who are signed to independent record labels, Dimitriou said. So far, the site has has 1800 artists or bands selling music, he said. Most are from the US, Australia and Canada, but about 50 countries are represented in all, he said. Not everyone sells that much, of course, and Dimitriou said the top sellers are the musicians who engage the most with their audience. Likewise, much of the marketing for Kicktone comes from the musicians themselves, he said. “It’s more often that the band is directing their own fans to the website, but we bolster that by doing a bit of marketing of our own,” said Dimitriou. Dimitriou previously headed a music website called Tindeck, which he described as a “simple MP3 hosting site” for uploading free music. The site had 90,000 user accounts, but Dimitriou received many requests from users who wanted to sell music, he said. Dimitriou and two co-founders applied and were accepted into ANZ Innovyz START, an Adelaide- and now also Sydney-based accelerator that is sponsored by ANZ Bank. The program provided $18,000 in seed funding. More recently, Kicktone has opened a $750,000 funding round. The startup hopes to close $350,000 of that amount in the next three months, with the remainder to be raised in the following six months, he said. ANZ Innovyz’s presence in Adelaide has contributed to great growth of a startup scene in South Australia over the last two years, according to Dimitriou. However, finding funding remains difficult in Australia, where investors tend to be more averse to risk than in other countries, he said. Even so, Dimitriou said he plans to stay in Australia for the foreseeable future.